Why People Don't Heal and How They Can | Free eBooks Download - EBOOKEE! Posted on 2013-11-12, by nobihai. 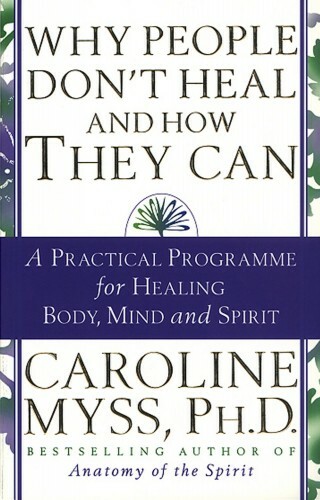 Why People Don't Heal and How They Can By Caroline Myss 1998 | 288 Pages | ISBN: 0609802240 | EPUB | 3 MB For more than fifteen years, Caroline Myss has studied why some people heal, while others do not. In her previous book, Anatomy of the Spirit, Dr. Myss illuminated the hidden interactions of belief and body, soul and cell to show how, as she inimitably puts it, "your biography becomes your biology." In this new book, she builds on her earlier teachings of the seven different energy centers of the body to provide a vital self-healing program for physical and spiritual disorders. With her characteristic no-nonsense style and high-voltage storytelling, she exposes and explodes the five myths about healing, explains the cultural and individual contexts in which people become physically and spiritually ill and invested in "woundology," and teaches new methods of working with the challenges that the seven energy centers embody. Both visionary and practical, Why People Don't Heal and How They Can presents a bold new account of the development of human consciousness and spirituality over the ages, and examines the dynamic global transformation of attitudes about healing. To help you get and stay on the path to wellness, Dr. Myss provides rituals and prayers for gaining a symbolic perspective on your life issues; for bolstering your personal power; and for connecting with a universal divine energy. Dr. Myss's breakthrough views on energy medicine and her active approach to healing life issues and physical illness will help you overcome the mental blocks that keep you from becoming well. No comments for "Why People Don't Heal and How They Can".